The beginning of a new year is a great time to start fresh and get organized. For specific projects, of course I use my own book, A Sewist's Notebook (25% off through Jan. 8th!) 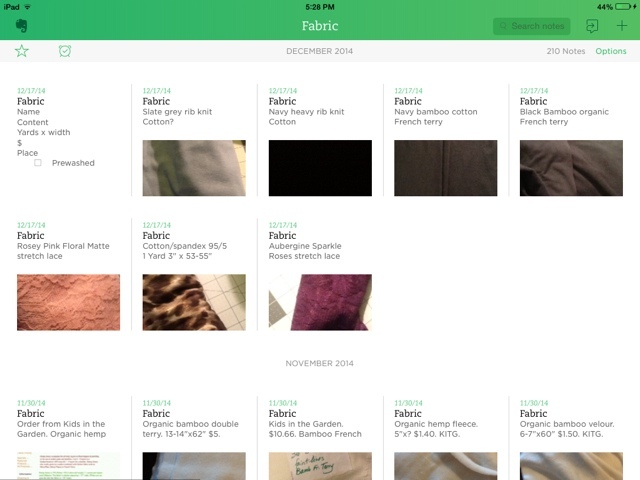 but today I'm going to show you how I use this powerful app to organize my fabric and pattern stashes. It's possible you've never heard of Evernote, but it's one of the most useful apps I have on my iPad. I use it for personal stuff, but the company offers a wide range of business products as well (receipt scanners, paper notebooks that scan into the app...awesome stuff!). I've been using it for years and it's only gotten better. The best part? The basic app is free! So what is it? It's basically the best note-taking system you'll ever find. 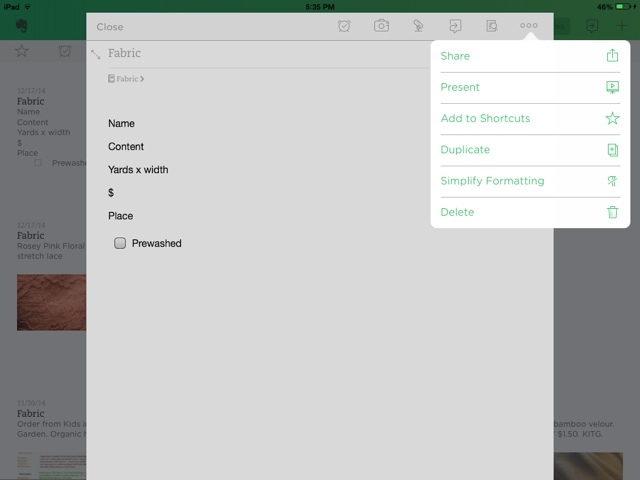 You can create checklists, store photos, make notebooks, and make notes within those notebooks. For example, I have one notebook for Fabric, and one for Patterns (you can ignore the other random notebooks in here!). When I open my Fabric notebook, at a glance I can see all the individual notes I've made. I've made one note for each fabric I've ever bought. I've done the same with my patterns. With a flick of my finger I can scroll through every fabric and pattern I've ever owned. I do not have a smartphone, but imagine how useful this information would be if you're out running around and can't remember what you have at home (the app will sync across all your devices)? Let's take a closer look at what information I've stored in each type of note. Long ago, I set up a template of what I wanted to know about my fabrics. I have one note saved with the blank template, and simply hit "duplicate" when I need more "copies". Once I have my duplicate note, I fill in the blanks. 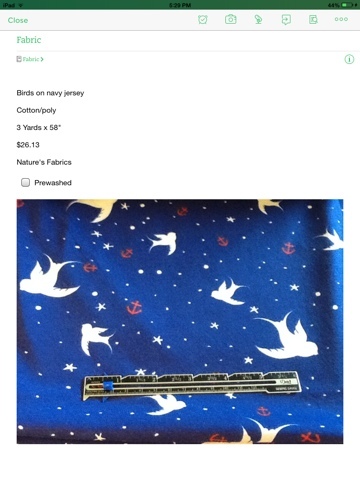 I like to note the "name" of the fabric, fiber content, width of fabric, how long it is, the price I paid, and where I bought it. I include a checkbox so I know whether or not I've prewashed the fabric. I also snap a photo with the camera on my iPad. The ability to take a photo is why I use Evernote and not some sort of pen and paper swatch system. The notes for each pattern are much more simple. They are completely photo-based. I photograph the front and back of the envelope and boom, done! Obviously, it took a lot of work to build these two notebooks, but I didn't do it all at once. I have a system in place for "checking in" new materials and that way I never get overwhelmed with entering information. Next week I will go over the method I use for logging new goodies into Evernote. Have you ever used Evernote? Do you like digital file systems or are you partial to pen and paper? I have the same habit of checking in all my new fabrics and patterns! I use Tap Forms (I made a post on my blog a while back) and it is pretty similar. On difference is that I like to have the fabric and notions requirements on the app so that I can check what I need while shopping. I was so excited to see the title of your post. 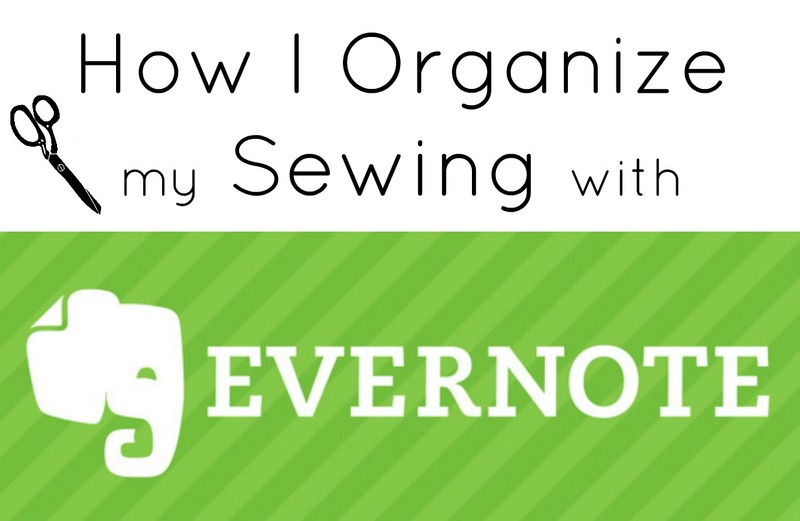 I use Evernote and have a sewing notebook there. I also made my own digital planner using Evernote (it's a separate notebook obviously). I never thought of adding my fabric stash - great idea! I have a queue and a wish list section in my book, but I think it might work better in Evernote since both change so frequently! I've downloaded the app on my phone a few months back and that's as far as I got with it. I think your post has inspired me to actually put it to use! Do it! Even if you don't go back and log everything you own, you can start fresh! Well thank you!! I think I would really love this app! I always get in the quilt shop and forget what I have at home or need to pick up. Good lookin out here ma'am!! I don't quilt but I'm sure you could customize it for whatever you want! I have the same system, of course mine is the old fashion binder system where I have swatches of 90% of my fabrics, and copies of 99% of my patterns. I did not know about this app. I may give it a try and use it to log my 2015 projects and to record patterns and fabrics I purchase in 2015. Thanks for posting. Oh wow, what an awesome idea! I use Evernote for a lot of things already, but hadn't thought to put craft information in there. I've tried to organize my fabric stash using a spreadsheet before, but it's not as useful as Evernote would be. I could tag everything--fabric content, size, color--and click on the tag when I wanted to see if I had the right fabric for a project! And I love your template idea--I'm going to steal it. Thank you! I thought about using Evernote on my phone for patterns but I am concerned about the size of the file. How large is your file? The entire app takes up 400 MB, which makes it the third biggest app on my iPad. 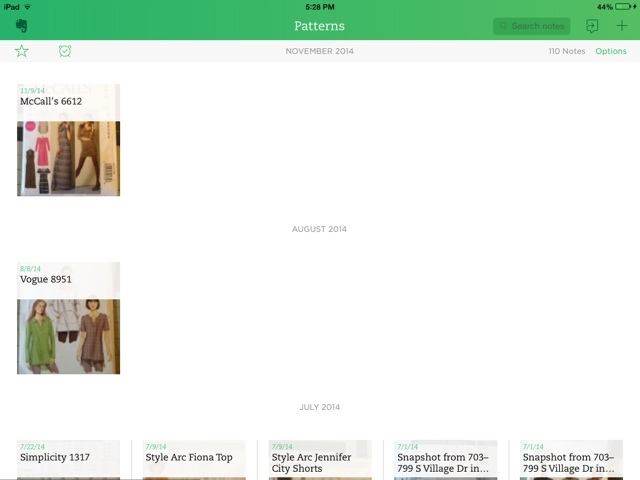 I typically don't pay for apps or anything but Pattern Review is a life saver and time saver. Since it has permission with not only the big pattern companies but also with all the indie companies. You can search by pattern number, type, everything. You can check the "I own" or stash or "I want" or wishlist. It has the pictures of the pattern, back cover info for fabric requirement notions etc. Which is awesome. You can sign in from your phone so you can open it easily access it while shopping. This is great to keep your stash organized but also I love it for those awesome pattern sales...I know which ones top pick up quickly because I have a list. Then I just change it from wishlist to stash. 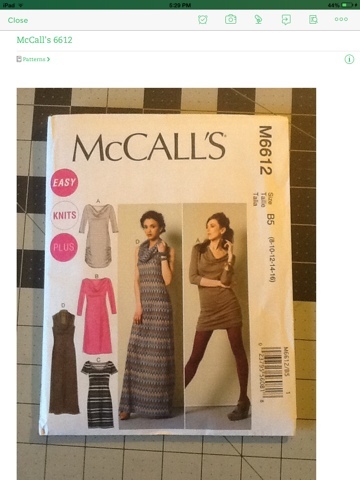 It also keep notions you can read reviews of any pattern which is a huge help. What runs large which directions aren't great..but also has reviews of sewing machines themselves..